The Moscow-based freight carrier keeps on enlarging and renewing its fleet. In Seattle, they received their 10th Boeing 747-8F out of a total order of 20 units. The aircraft is scheduled to arrive at its new home base Sheremetyevo Airport (SVO) at 23:30 UTC tonight. 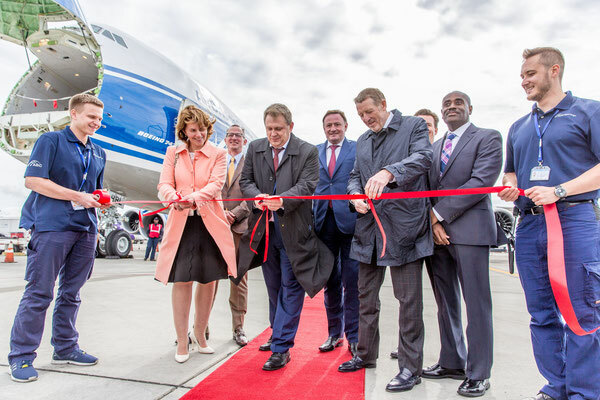 The handover ceremony at the U.S. plane manufacturer’s production plant at Everett, Washington State also kicked off the twice-weekly 747-8F flights taking from Seattle to Moscow via Chicago and Europe. Hence, local Tacoma International Airport (SEA) becomes the Russian freight carrier’s sixth online destination in North America. Due to the new delivery, ABC’s 747 freighter fleet consisting both of -400Fs and -8Fs which has grown to 16 units with more to come. However, each time a further 747-8Fs is handed over, the freight carrier announced to retire one of their remaining 747-400Fs. The deal he speaks of was sealed by both enterprises last July at the Farnborough Air Show in Hampshire, UK. The long-term agreement covers the provision of logistics services by the Volga-Dnepr Group to Boeing and its partners using V-D’s and ABC’s combined fleets of AN-124-100 and Boeing 747 freighters. Volga-Dnepr owner Isaykin is heading ABC on an interim basis until a successor is nominated to replace former ABC Chief Denis Ilin, who exited ABC on 31st July this year.